Product prices and availability are accurate as of 2019-04-11 09:49:33 EDT and are subject to change. Any price and availability information displayed on http://www.amazon.com/ at the time of purchase will apply to the purchase of this product. Following Argentina's military operation to take possession of the Falkland Islands/Islas Malvinas, British Prime Minister Margaret Thatcher's government launched a major naval operation to return them to British rule. Defending the Royal Navy task force were two small squadrons totalling 20 Sea Harriers (SHARs). 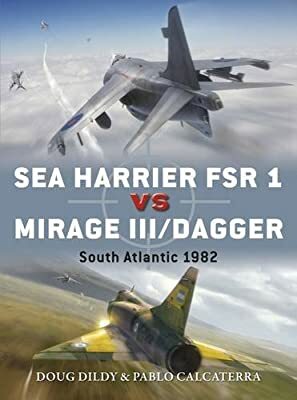 Initial clashes between SHARs and Argentine Mirages and Daggers on 1 May 1982 failed to eliminate the Sea Harrier defenders. FAA fighter-bomber pilots relied on daring and courageous ultra-low level attacks, frequently escaping the Sea Harrier's limited capabilities, against Royal Navy warships and auxiliaries, causing considerable damage during Operation Corporate, the large-scale amphibious operation to repossess the islands. Publishing 35 years after the end of the conflict, this fully illustrated volume offers a balanced and objective examination of the SHAR and the Argentine Mirage and Dagger aircraft, highlighting the attributes of both and the skills and courage of the pilots flying them.